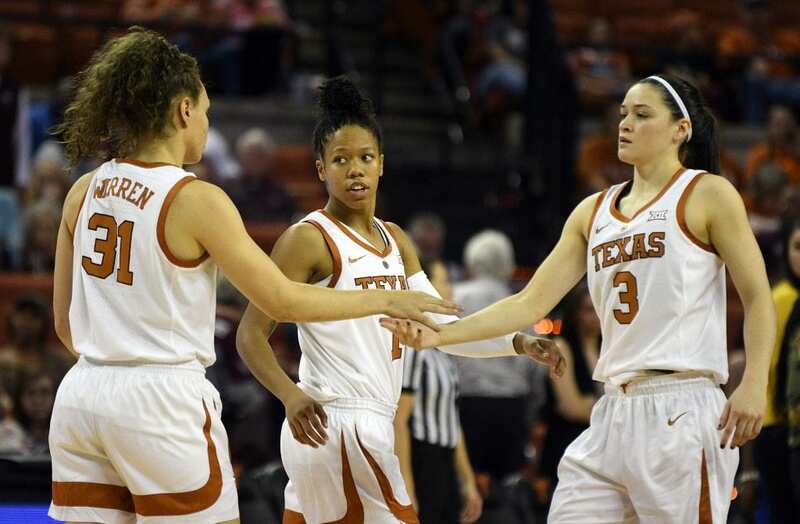 The rivalry with Tennessee certainly did not disappoint, even though the Texas Women's Basketball team narrowly lost to the Vols 88-82 at the Erwin Center Sunday afternoon (Photo courtesy of Texas Sports). AUSTIN, Texas — If the Longhorns look like this on offense every game, Texas has a true chance to go deep into the NCAA Tournament this season. However, if the defense doesn’t tighten up a bit, the ‘Horns will have to pour in the points to have a chance as evidenced by No. 12 Texas’ 88-82 loss to No. 9 Tennessee at the Erwin Center Sunday afternoon. The effort level against the Volunteers as opposed to how the ‘Horns looked a week ago in a loss to Mississippi State was leaps and bounds better, according to Texas head coach Karen Aston. Texas took it to Tennessee to start the game with Audrey Warren on fire in the first quarter. Warren poured in more than half the ‘Horns points in the first quarter, scoring 12 of the 23 Texas points as the ‘Horns grabbed a 23-14 lead after one. Warren wound up with a career-high 21 points on 7-of-12 shooting and 2-of-3 on 3-pointers. The shots stopped falling for the ‘Horns in the second quarter, though, as layups went wide and 3-pointers clanked off the iron, allowing the Volunteers to battle their way back. Tennessee took a 29-27 lead with 4:56 remaining before halftime, and started to pour it on offensively, running all the way out to a 40-31 advantage with less than a minute before the break. Though the Vols outscored Texas 26-12 in the second quarter, with the home team going 3-for-17 from the floor in the frame, the ‘Horns scored the final four points of the half to make it 40-35 at the half. Even with the close misses, which continued on into the second half, the Longhorns never let frustration settle in or stopped communicating. That step forward will take Texas a long way, according to Aston. “You know it’s interesting because I thought that’s one of the places we grew today,” she said. “Because in timeouts, before they’ve seemed dejected and there wasn’t much of a connection. But I thought today they were trying to communicate with one another and I know that sounds kinda crazy but that is part of growing as a team, especially when you have so many new players. 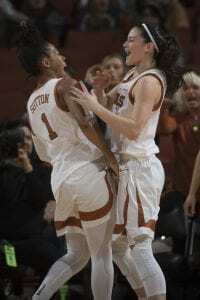 Sug Sutton and Danni Williams celebrate one of many highlight moments for Texas in a close loss to Tennessee Sunday (Photo courtesy of Texas Sports). The energy and intensity stayed strong all the way down to the wire. Both teams wound up with more turnovers than assists. Heading into the final quarter Tennessee held a slight 62-57 advantage, with Texas rallying to within two with 7:06 to play. The ‘Horns could never get back over the hump, though, pulling within 74-73 with 3:19 to play and making it a three-point game with 24 seconds left and again on a Danni Williams 3-pointer with 16 ticks left. The Volunteers made their free throws to to keep Texas at bay and hang on for the win, though. “I am pleased we scored more points but I still think that when we look back at this, some of those offensive possessions when we felt we were about to take the lead or tie it up, we got to antsy with the ball,” Aston said. Tennessee’s starting guards gave the Longhorns more than they could handle, as Evina Westbrook and Meme Jackson combined for 56 of the Volunteers points. Jackson had 33 while going 4-for-9 from 3-point land, while Westbrook added 23 while knocking down three 3’s. “They’ve got guards that can really make shots. We didn’t have an answer for those two guards today,” Aston said. Williams wound up with 14 points and a game-high eight rebounds along with Texas’ only two steals of the game. Destiny Littleton pitched in with 13 points and four boards, while point guard Sug Sutton added 11 points, six rebounds and five assists. An emotional Aston made it clear how much this game means to Texas, to Tennessee, and to everyone involved in this decades-long rivalry, including paying homage to former Texas coach Jody Conradt and Tennessee legend Pat Summitt. Joyner Holmes also saw her first action of the season, scoring two points with three boards in 11 minutes of action. Holmes having a chance to play after injury kept her out to start the season is a big boost for the Longhorns looking forward to Big 12 Conference play in January. Texas now has a week off between games before taking on Stetson next Sunday at 1 p.m. at home once again at the Erwin Center.